Research Week at the Royal Institute of Art in Stockholm is a diversified programme of presentations and activations that unfolds around the subject of artist research and development projects relating to the expanded fields of contemporary visual art, architecture, urban research, and science. The programme is launched on 26 January with a lecture by French philosopher Catherine Malabou, titled “Plasticity versus Inscription: A Change of Paradigm,” as part of the recently initiated institutional research platform The Domain of the Great Bear. 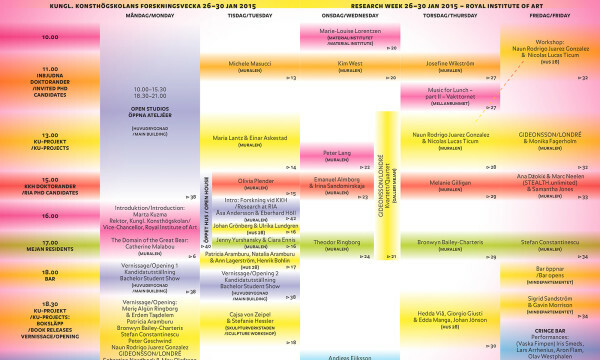 Research Week includes presentations by the institution’s PhD candidates Olivia Plender (“Blind Eye”), Emanuel Almborg (“The Utopian Image, Absolute & Incomplete”), Melanie Gilligan (“The Common Sense”), and Ana Džokić with Marc Neelen/STEALTH.unlimited (“Practicing Engagement & Disengagement”). Presentations by visiting PhD candidates will include those by Michele Masucci (“Human Agency & the Wellness Imperative: Computable Bodies, Poetic Disruptions”), Kim West (“From Culture Centre to Information Centre: Kulturhuset & Its Alternatives, 1963–1977″), and Josefine Wikström (“Practice in/As Contemporary Art vs. Practice in/as Research in Art”). Additional projects and presentations will be made by the institution’s Mejan Residents (Theodor Ringborg, Bronwyn Bailey-Charteris, Jenny Yurhansky, Stefan Constantinescu) as well as externally funded researchers (Ellie Ga and Andjeas Ejiksson). Contributions will also be made by faculty staff, current, and alumni postgraduate students as well as by external collaborators and invited guests involved with the institution’s artistic research and development funding projects. The Material Institute, a long-standing forum for investigation around art materials and now a cabinet of curiosities with a collection of about 1,000 pigments dating back to the 1850s will be open for public visitation as will the Cringe Bar, an event-based performance evening scheduled on Friday, 30 January. In tandem with this year’s Research Week, the Royal Institute of Art will host open studios. All enrolled BA and MFA candidates’ studios will be open to the public and each student will be available to discuss his/her work in an informal setting. Also the first year BA students will open an exhibition of their work commencing Monday, 26 January. The Body of the Otzi Man— also known as the Ice Man, was discovered on 19 September 1991 n the Ötztal Alps on the Austrian–Italian border. He could have surfaced at several significant historical moments, given the rolling movement of the glaciers across the mountains, and the periodic warming trends. He could have surfaced during the height of the Roman Empire, for example. Metaphorically speaking, Otzi”s condition is not unlike what would confront a time traveler, either in the H.G. Wells’ sense of the Time Machine, 1895, which moves some 800,000 years forward to the end of earth’s existence, or as another example Woody Allen’s 1973 Sleeper where a health food shop owner finds himself revived from a botched surgery 200 years later under a government dictatorship. In other words the action around Otzi’s destiny runs twofold, he is a victim of geographical circumstance, becoming the object of a border dispute that is itself over a century old, though with geopolitical inaccuracies and recent melting glaciers his case remains theoretically unresolved. Otzi was probably killed for trespassing into another tribal areal, and was discovered by Austrians trespassing into Italian territories. The Otzi Man can be considered one of the first documented aliens to be caught in a cross border dispute, and one of the first to be the subject of intense national rivalries. He makes a good example for further study.